The invasion fleet embarking the expeditionary forces left Pearl Harbor on June 5, 1944, the same day Operation Overlord was launched with the invasion of Normandy (AKA the D-Day landings). The Normandy landings were the larger amphibious landing, but the Marianas invasion fielded the larger fleet. By July 7, the Japanese had nowhere to retreat. Saito made plans for a final suicidal banzai charge. On the fate of the remaining civilians on the island, Saito said, “There is no longer any distinction between civilians and troops. It would be better for them to join in the attack with bamboo spears than be captured.” At dawn, with a group of a dozen men carrying a great red flag in the lead, the remaining able-bodied troops, about 3,000 men, charged forward in the final attack. Amazingly, behind them came the wounded, with bandaged heads, crutches, and barely armed. The Japanese surged over the American front lines, engaging both Army and Marine units. The 1st and 2nd Battalions of the 105th U.S. Infantry were almost destroyed, losing 650 killed and wounded. However, the fierce resistance of these two battalions, as well as that of Headquarters Company, 105th Infantry, and elements of 3rd Battalion, 10th Marines (an artillery unit) resulted in over 4,300 Japanese killed. For their actions during the 15-hour Japanese attack, three men of the 105th Infantry were awarded the Medal of Honor – all posthumously. Numerous others fought the Japanese until they were overwhelmed by the largest Japanese Banzai attack in the Pacific War . Many hundreds of Japanese civilians committed suicide in the last days of the battle, some jumping from “Suicide Cliff” and “Banzai Cliff”. Efforts by U.S. troops to persuade them to surrender instead were mostly futile. Widespread propaganda in Japan portraying Americans and British as “devils” who would treat POWs barbarically, deterred surrender (see Japanese Military Propaganda (WWII)). In the end, about 22,000 Japanese civilians died. Almost the entire garrison of troops on the island — at least 30,000 — died. For the Americans, the victory was the most costly to date in the Pacific War. 2,949 Americans were killed and 10,364 wounded, out of 71,000 who landed. 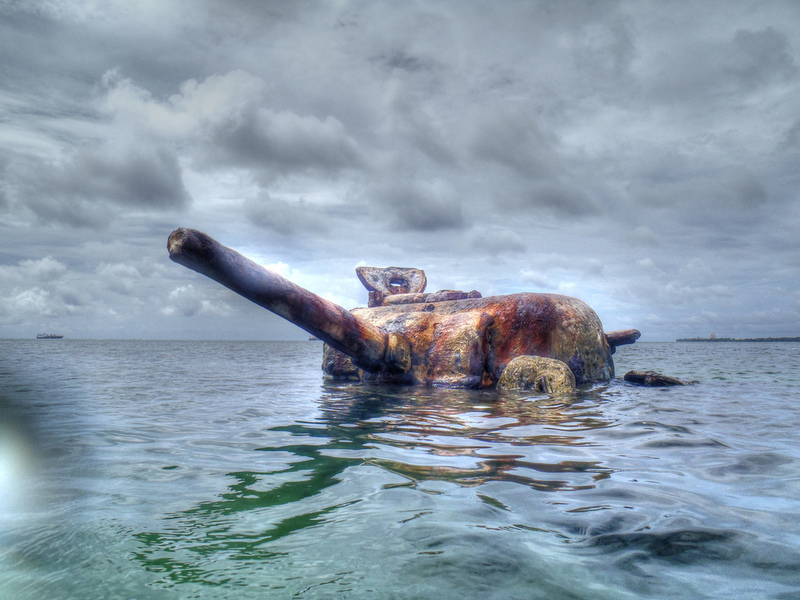 The Tank was probably off-loaded from an Landing Ship, Tank or LST (not so jokingly referred to as Large Slow Targets). It is also possible that the LST was disabled by Japanese shelling. The tank crew may have tried to make a mad dash to the beach but it was just too far away. 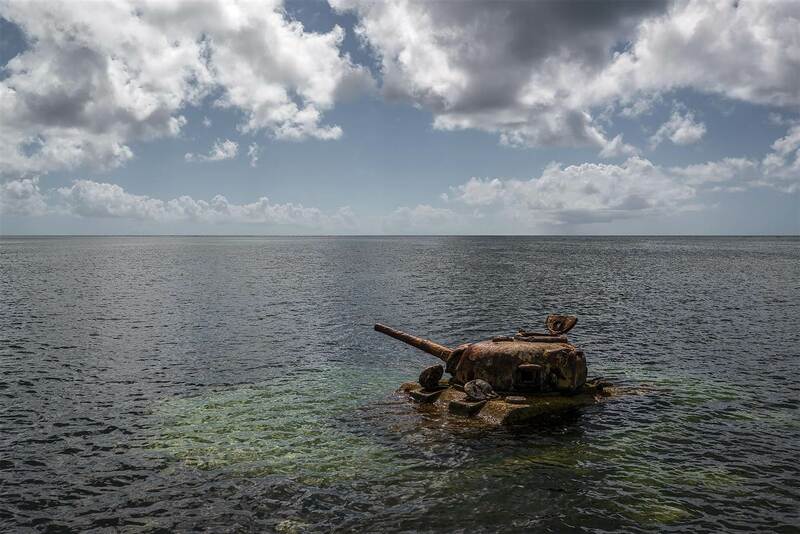 The water was shallow enough that the crew probably escaped without drowning, but, the withering rain of bullets, artillery and mortar fire may have killed them. 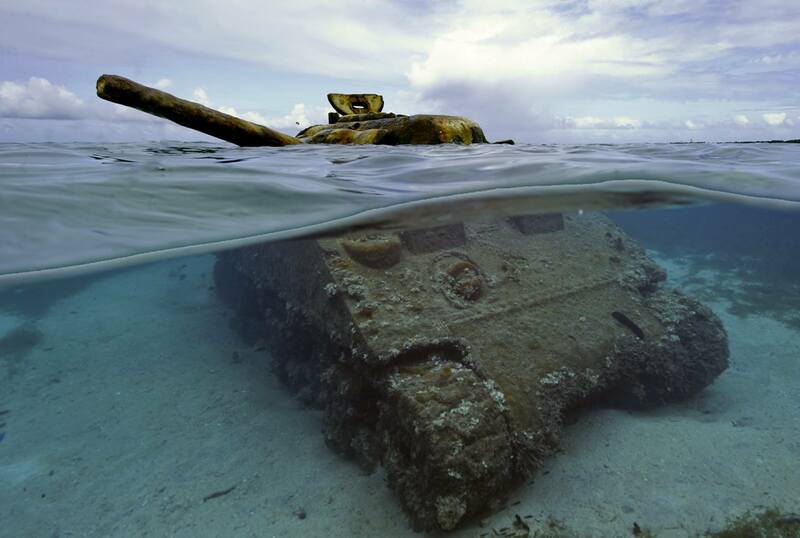 This tank was about 300 meters off the beach. 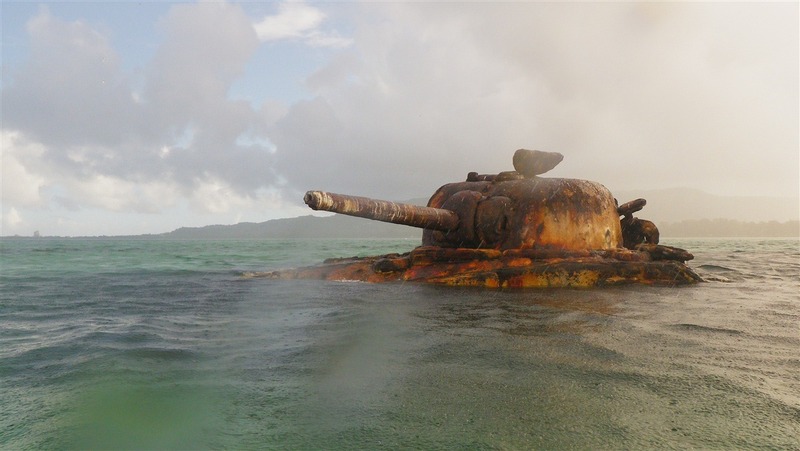 There were 3 but not really close to each other and this one is turned and looks to be engaged with a pillbox on the shore and has a nasty antitank round below the water line on the starboard side right behind the driver/front gunner. Being the typical tourists we couldn’t resist swimming out and getting close to it and checking it out. I will see if I can find the interior shots of it. What was really neat is the barrell is actually pointing at a bunker/pillbox that had taken a shot and collapsed. Henry II, also known as Duke d’ Orleans, was a great monarch of the House of Valois and was King of France from 1547 until 1559. He was a competent administrator who was an active suppressor of Protestants in his territory. Like his father, Francis I, Henry favored the arts, and he was a patron of Renaissance culture. The King was involved in projects which were begun by Francis I, including the reconstruction of Louvre, and his major project was the chateau of Anet. He also loved literature, especially poetry, and wherever he appeared, he was beautifully dressed in the latest fashion. Married to Catherine de’ Medici and the father of future monarchs Francis II, Henry III, and Charles IX and seven other children, King Henry fell in love with the beautiful aristocrat Diane de Poitiers when he was 16 and remained in love with her until the day he died. Diane was 20 years his senior. One of his most magnificent items of dress was the Parade Armor which today can be seen on display in the Metropolitan Museum of Art in New York. 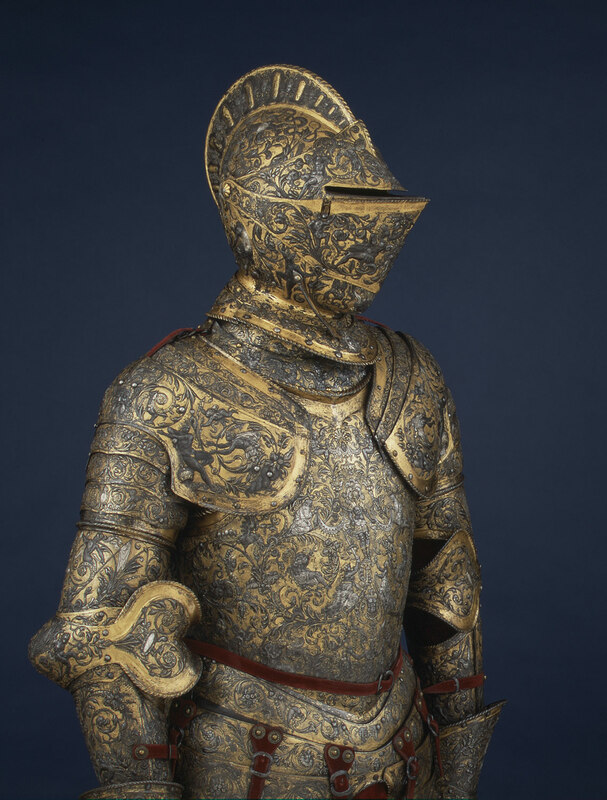 It is believed that this fabulous armor dates back to the 16th century (1553-1555) and it was intricately decorated by Etienne Delaune, a French goldsmith and engraver. He had a great style which was based on the style of the Little Masters of Germany. he armor was one of the king’s ceremonial costumes and is embossed on the breastplate and back with figures that reflect his great military achievements. The whole armor is adorned with images of human and fantastical characters. At the center of the breastplate is a figure of a Roman warrior receiving a tribute of arms from a group of ladies who are kneeling, and above them, on the shoulders, the god Apollo can be seen chasing the nymph Daphne. There is also a carving of Apollo on the back of the armor, but in this depiction, he is slaying the monster Python. Henry’s badge, in the shape of a crescent moon, appears in several places. 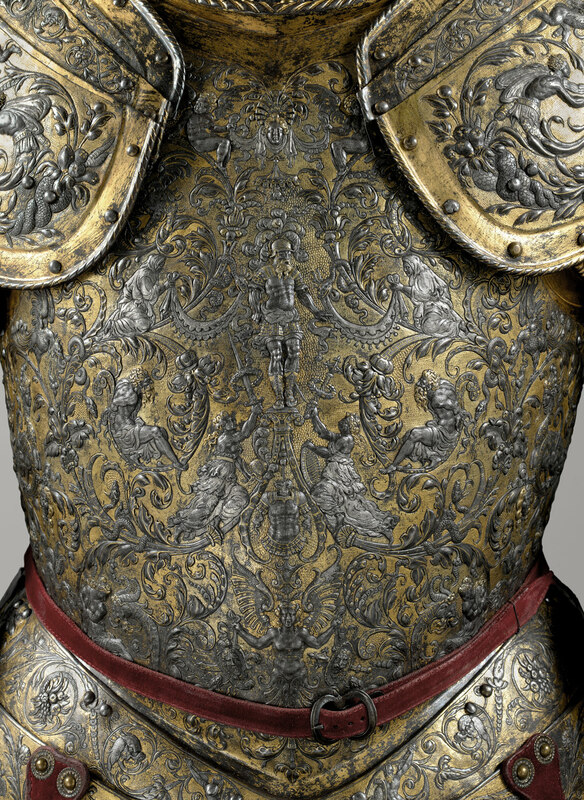 Many historians and art critics believe that the armor is one of the most elaborate of its kind in France. There are about 20 sketches from the 16th century which many historians believe were made by Delaune. Henry II died after a jousting accident. A fragment of a splintered lance drove into his eye and he contracted septicemia. It is not known what armor he wore at the joust. The popular image of the Vikings is one of fearsome warriors wearing horned helmets. Many depictions of the Vikings display this particular attribute. However, there is only one preserved helmet from the Viking Age and this does not have horns. On March 30 1943, historians in Oslo gained the information that a farmer named Lars Gjermundbo found and dug into a huge mound on his land near the farm of Gjermundbu, southern Norway. The place was examined by archaeologists (Marstrander and Blindheim) the next month and the result was really fascinating. The mound was 25 meters long, 8 meters broad in the widest place and 1.8 meters high in the middle part. The most of the mound was formed by stony soil; however, the interior of the middle part was paved with large stones. Some stones were found even on the surface of the mound. In the middle part, about one meter below the surface and under the stone layer, the first grave was discovered. It is believed that one of the buried men was a petty king from the Ringerike area. 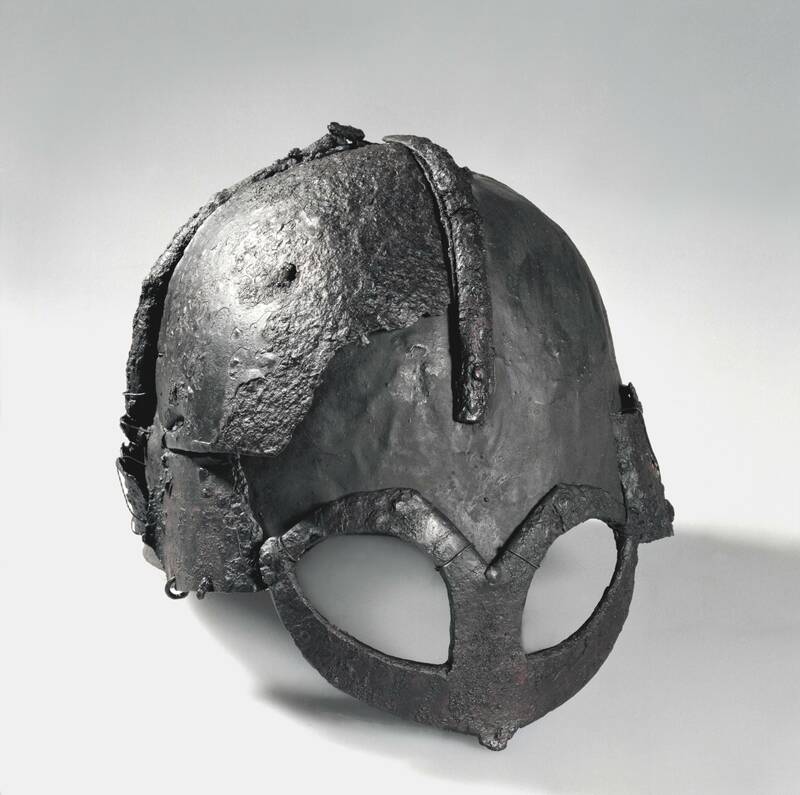 The helmet is often described as the only complete helmet known from the Viking Age. 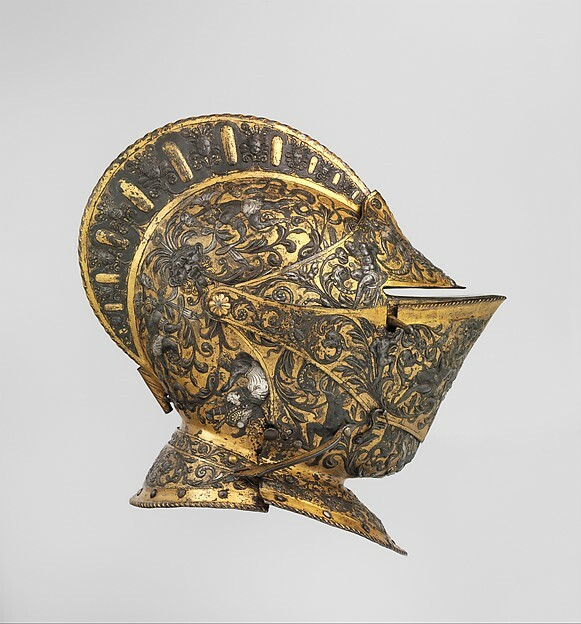 The helmet was made of iron and was in the shape of a peaked cap made from four plates.The helmet consists of the spangen, or a horizontal rim and two vertical strips which together form the framework of the helmet, onto which the iron plates are riveted. 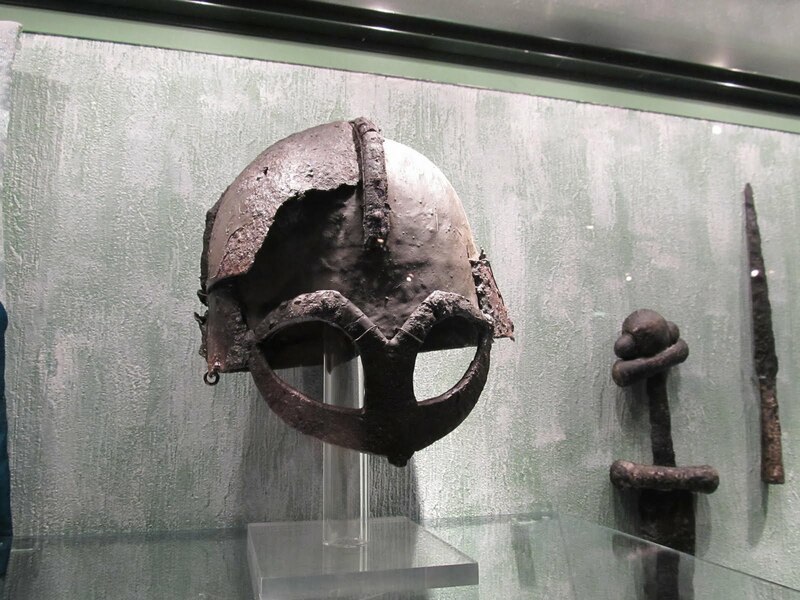 The Gjermundbu is a typical example of a Viking spectical helmet, which offers the carrier good face protection while also guaranteeing an adequate field of vision. The helmet shares similarities with other preceding helmet designs, such as the Vendel helmets. These include the rounded cap, the spectacles, as well as the mail aventail. It is now on display at the Museum of Cultural History of the University of Oslo.